Don Grundy...my mind's eye saw 'DAD (as in Daddy, Father) Tuning and I thought to myself (obviously short on morning coffee) "Awww....that's so sweet! His Daddy tunes his dulcimers for him! I wish my Daddy would do that!" Thank you, Lisa. I’ll contact Cedarcreekdulcimers. I should have done that. There are two ways to reach DAD from GDG. You can use heavier strings to go DOWN to standard DAd tuning. A McSpadden Ginger has a 23 and 6/15" VSL. With the recommended string sizes of .012, .016 and .026 it tunes very nicely to DAd in the same octave as a standard-sized dulcimer. Or you can go UP to the higher octave. A Ron Ewing dulcimette has an 18" VSL. With .010, .012 and .020 strings it can tune to DAD one octave above standard. But that's high tension -- I usually tune my dulcimette down to C or Bb instead of D -- so I have doubts about taking a 22-inch VSL to the high octave unless you use very light strings (.009?). At 22 and 1/8 inches, your backpacker can probably take Ginger strings and tuning. I suppose I should ask the obvious questions: have you tried taking your current strings and tuning them down to DAd? What happens? Are they a little floppy or a total disaster? Have you contacted Cedar Creek and asked them about strings for DAd? ETA: Folkcraft's FolkRoots Travel Dulcimer has a 22" VSL and uses .012, .015 and .024 for DAD in the standard octave. There you go. For what it's worth, I'm building an 18" vsl Octave dulcimer and Ron Ewing recommended, for DAD tuning, that I use 10, 14, and 20 ga. strings. I'll let you know who it works when I finish it. If it’s practical; I’ll take it to a luthier for new strings. Do you know the string gauge of your strings? The VSL is 22 and 1/8 inches. You could try ADDd on the GDDd. the bass string should be ok going up one step to 'A' [give Cedar Creek a call and verify]. It should be compatible with the DAd players then, although chording may be a problem . Thank you. 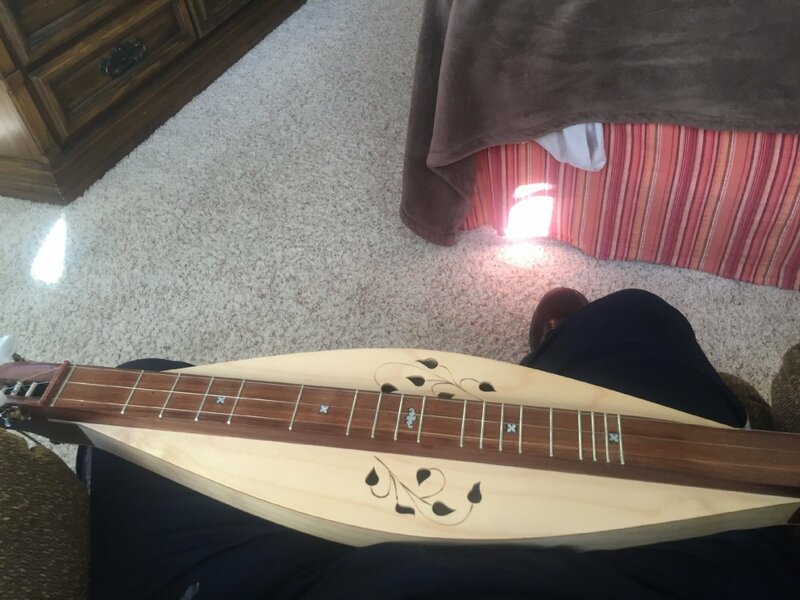 I’m very fond of my backpacker dulcimers by Cedar Creek Dulcimers. They are tuned. GDg and GDDd. I guess I won’t take them to the club meeting. The shorter you go, if you want to stay tuned to DAd you'll have to put on heavier strings so it won't start feeling floppy. Personally, if I wanted to have relatively 'normal' gauge strings for DAd tuning, I wouldn't go shorter than around a 23" scale. Don, the questions isn't as simple as you might think because VSL and string gauge both vary, so different VSLs might require different string gauges to get the same tones. Standard size dulcimers can probably be thought of as having at least 25" VSLs. Dulcimers smaller than that, say in the 22-24" range are usually tuned up a fourth or fifth to G or A, but not always. A lot of people play the McSpadden Ginger model tuned DAd. And Skip's suggestion of using a capo at the 7th fret demonstrates, you can also get DAd an octave above a standard dulcimer. There are a few really well-made octave dulcimers out there, Ron Ewing is probably the best known builder. That's a pretty broad question. Commercial, for sale, is probably around 19-20". Folkcraft has a travel dulcimer with a 22" VSL. It's possible to make them very short. For example, put a capo on fret 7 on yours. You have effectively created a very short VSL, the capo making the fret a zero fret. Move the capo more towards the bridge and the VSL will get shorter. Playability/tuning not considered. What is the shortest VSL for DAd tuning?